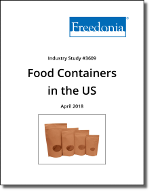 This study examines the US market for food containers. For purposes of this study, a container refers to a product that houses a food item that features a closure designed to be opened by the end user. This includes both primary and secondary packaging. However, this excludes packaging such as shrink wrapped items or tray and film combinations common in meat and related products. Product segments covered include flexible and rigid. Flexible containers include bags and pouches in both plastic and paper formats. Rigid containers include plastic, paperboard, metal, and glass applications. Rigid containers cover cartons, cans, cups/tubs/bowls, bottles, jars, and clamshells. Both retail and commercial foodservice food containers are included. Historical data (2007, 2012, and 2017) and forecasts for 2022 are presented for demand for food containers by unit and value in current dollars (including inflation); demand data by market is presented in current dollars. Also presented are historical and forecast data for raw material usage in food containers in pounds and total dollars. “Demand” (or sales) is defined as all shipments from US plants, plus imports minus exports.